The tragedy of the last week’s earthquake in Italy will not soon be forgotten. The small town of Amatrice was one of the most impacted. While the scars of the devastation, loss of lives and injuries will long remain, there is pride in a global restaurant movement to celebrate the heritage of Amatrice, the namesake of one of Italy’s best comfort foods, Bucatini all’ Amatriciana, while raising money to donate for the victims through the celebration and enjoyment of this delicious pasta dish. Decades before Starbucks and imitators launched cold coffee and frappuccino beverages, Italians have been enjoying cool and refreshing granita al caffè, the great-granddaddy of cold coffee drinks. A cross between a slushy and sorbet, granita al caffe originated in Sicily. It is made from lightly sweetened espresso that is frozen and then crushed, prepared like a sorbet. Enjoy it with a generous dollop of “panna”, whipped cream. In Italy, whipped cream is typically unsweetened; it is a nice counterpoint to the sweet espresso. 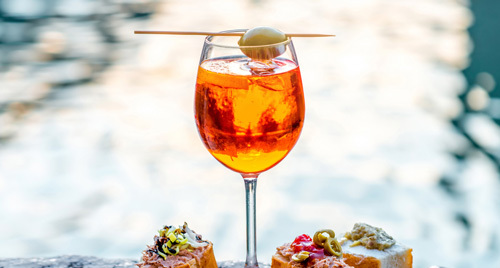 Relax with a reverie of your trip to Italy while you sip one of these iconic Italian aperitivi (pre-dinner cocktails). An aperitivo is your chance to transition from your day to dinner, lightly alcoholic to relax and with some flavor and nibbles to stimulate your appetite.